Stuart H. Orkin, MD, the 2018 recipient of the Mechthild Esser Nemmers Prize in Medical Science at Northwestern University, delivered a keynote lecture on harnessing genetics to treat blood disorders. 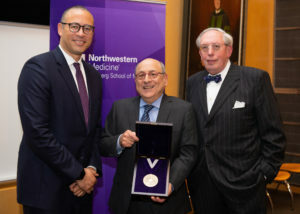 As the 2018 recipient of the Mechthild Esser Nemmers Prize in Medical Science at Northwestern University, Stuart H. Orkin, MD, a pioneering hematologist, delivered a keynote lecture about harnessing genetics to treat blood disorders. The Nemmers Prize in Medical Science is awarded to a physician-scientist whose body of research exhibits outstanding achievement in their discipline as demonstrated by works of lasting significance. Orkin is the David G. Nathan Distinguished Professor of Pediatrics at Harvard Medical School, and a Howard Hughes Medical Institute Investigator at Boston Children’s Hospital and the Dana-Farber Cancer Institute. Orkin’s research has led to a number of breakthrough findings in hematology, including on the development and function of the blood system, the control of stem cells and the molecular basis of inherited blood disorders. 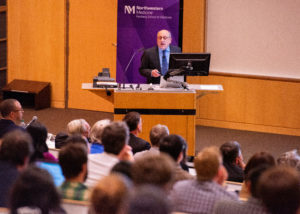 Jonathan Holloway, PhD, provost of Northwestern University, welcomed faculty, students and staff to the Mechthild Esser Nemmers Prize in Medical Science Lecture, held October 2, and provided an overview of the five Nemmers Prizes. Stuart H. Orkin, MD, center, joined by Jonathan Holloway, PhD, provost of Northwestern University, and Eric G. Neilson, MD, vice president for Medical Affairs and Lewis Landsberg Dean. During his lecture, Orkin discussed key discoveries in his laboratory and in the field, including on the control of fetal hemoglobin, mechanisms of the switch from fetal to adult hemoglobin, and the BCL11A gene as a target for genetic therapy of hemoglobinopathies, including sickle cell anemia and beta-thalassemia. Orkin also discussed promising gene editing approaches for sickle cell anemia and beta-thalassemia currently in clinical trials, as well as future directions for research. Throughout the day, Orkin also toured the Feinberg campus, attended a luncheon with cancer biology students and trainees, and met with faculty and leaders in the medical school. At the conclusion of the lecture, Eric G. Neilson, MD, vice president for Medical Affairs and Lewis Landsberg Dean, presented Orkin with a medallion in commemoration of receiving the Nemmers Prize. The Mechthild Esser Nemmers Prize in Medical Science, which carries a $200,000 stipend, was made possible by a generous gift to Northwestern by the late Erwin Esser Nemmers and the late Frederic Esser Nemmers. A jury of distinguished scientists from around the country made the final selection.